There is this unique energy that surrounds each of the Grand Slams for me. The French is the one that is about toughness and grit and heart and fitness. All of the main sources of great competitive energies are in play on the clay. I defeated a tough opponent, Mike Dahm, in today’s quarterfinal. 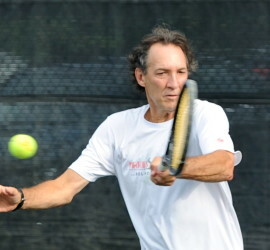 He is always a tough out as he has defeated many of the top players in the age group. Won today 6-1, 6-0. The games were closer than the sets. My opponent had a good game. Experienced, good hands, strokes, serve and a deceptive drop shot. He had game point five times but I was able to find some strong focus to win four of them.